Easter is almost here (finally — it seems so late this year) and we have another great sketch for you at Freshly Made Sketches. While the two (Easter and the sketch) don’t necessarily go together, I chose to make an Easter card with the sketch. Jen Brum is our talented hostess this week. She has such a gift for CAS cards and has made a fabulous sketch for us this week. I pulled out my Life in the Forest stamp set, which has not seen much ink. 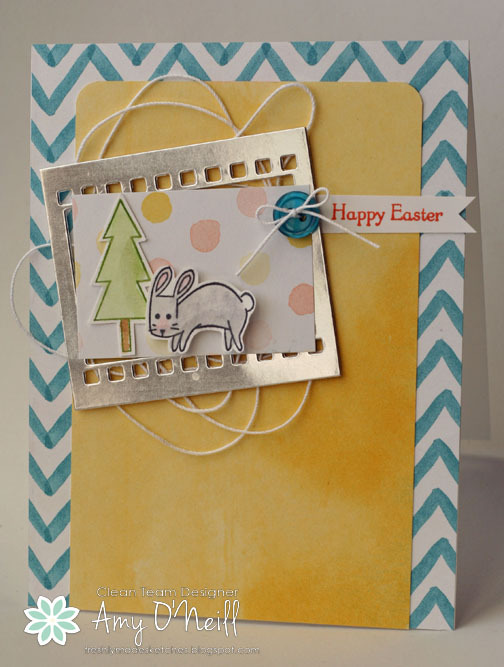 It has a cute little bunny in it so I thought it would be perfect for an Easter card. I die cut the film strip from a Silver Foil Sheet using the On Film Framelits dies. All of the dsp is from the Watercolor Wonder dsp pack. The sentiment is from Teeny Tiny Wishes. I have a big ball of crochet thread, and I cut off a long string and just randomly looped it around and placed the focal image over it. My daughter thinks it looks messy, but I think it’s kinda fun. We hope you’ll join us and make your own card for the challenge. If you do, please link it up in the gallery so we can see what you’ve made. We always enjoy looking through the gallery. You can check out what the rest of the design team made at the Freshly Made Sketches site. This entry was posted in Freshly Made Sketches Challenge, Life in the Forest. Bookmark the permalink. Total cuteness! Love the silvery frame and the swirly thread…..really adorable! 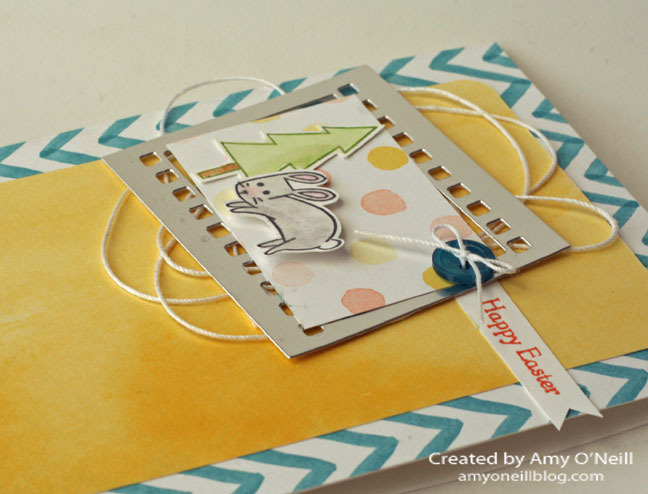 Such a cute card Amy; love it and how you used that little bunny! Very cute! TFS! Finally a card that will inspired me to use the Life in the Forest stamp set! So cute! What a fun take on the sketch! I love the little film strip. And I’ve got to agree with you that the crochet thread is NOT messy! I think it adds a little fun to a card too! Oh my gosh! This is so adorable and I LOVE the design. The colors/papers are fabulous, and the silver foil really brings attention to the focal point. Very cool how you did the twine, too. So so cute,Amy!! I love the cute bunny,the film strip and the string!! Great job! This is such a cool card, Amy! The silver framelit really packs a punch and I love the loopy twine. Amy, this card is so fun! I love that sweet little bunny! The film strip and the twine looks great! Love this take on the sketch! Completely cute card Amy! Love the little scene you’ve created and love the twine treatment too!